I'm about finished restoring a Keeney & Sons Model A Gun Game I picked up on eBay. This thing was in terrible shape when I got it. It was missing the front plate, gun and back door. The top marquee was in three pieces with both "feet" broken off but there. All of the guts were there along with the original glass and playfield sheet metal. On the underside of the cabinet is stenciled lettering saying Keeney & Sons etc. 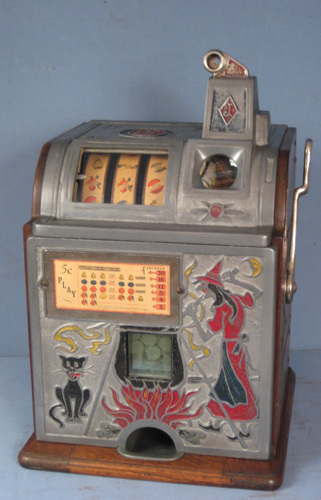 The interesting thing about this machine is the original finish used on the marquee and score castings. It's an antique bronze finish. It's painted on the aluminum castings. Has anyone seen a machine with this finish on the castings before? I'm wondering if the front plate should have the same finish or left as it is now.